Brick exteriors are quite popular, but did your builder take the time to consider leak problems with brick window sills? Let us take a look at how these sills should be made, and what may cause leaks. I recognize that there are many sellers out there complaining about the buyer’s home inspector, and Realtors calling us deal killers. Warning: this post deals with one of those issues, where a person may argue that I am being too detailed, and that I am making an observation that there is a problem, when no problem exists. I will admit that certain issues may not be an issue at the time of my report. They may never be a problem. However, something on the house was built incorrectly, and a problem could ensue. Therefore, I have the responsibility to make a comment. Brick window sills can be the cause of a leak at the window, when not installed properly. You see no issue with this brick window sill, do you? The brick is angled down, so rain coming down to the sill should drain away from the window. Yet the angle of this sill is not very great. Bricks are not always flat, smooth surfaces that allow water to flow freely.The brick should be angled to a greater degree to ensure water flow. 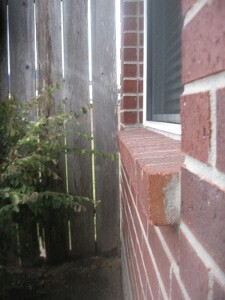 This angle was quite common in brick homes built in the last twenty years (1990 to 2010). My home was built in 1964, and the brick window sills were angled more. This is one of the indicators of a problem facing the building industry: the workers may not know the correct way to install some features on your home. The workers were trained by the supervisor, who himself was trained by someone who did not know. Good building managers will correct this knowledge, but some managers do not know, and no one informs them (or they do not listen to the people informing them). What happens with this brick? You will not see this often, but if the water has the chance to pool, that water can then find another way down. Maybe under the window sill. Once a flow of water has started, more water coming down the window pane due to the rain will follow. This is the cause of some leaks. Most leaks that I see on the interiors near windows are caused by other issues, but this photo is a good demonstration of one problematic condition. What is the solution? You can have a mason rebuild this sill in brick at a better angle (more than 15 degrees). Another solution is replacing the brick with a wood sill. This can be a nice decorative feature, if it fits in with the style of your home. There are also other materials which can be used, as long as you can angle the sill to shed the water. However, this may not be for you. This is an expense. You may need the money for other projects, and again, you may not be having a problem on a newer home, but as the home ages, the chances of an issue increase. This is because the brick deteriorates. Evaluate your own brick sill to see if you may need to worry about this kind of brick window sill. This entry was posted on Wednesday, November 24th, 2010 at 2:00 pm	and is filed under Home Maintenance-Consumer Info. You can follow any responses to this entry through the RSS 2.0 feed. My husband and I are purchasing our first home and we found leaks around the windows during an inspection of a new home. We are scared but everyone keeps telling us that the builder will fix it and we should not be concerned. Would you consider this problem a deal breaker? (fyi, the windows are also located inside a curved wall behind a spiral staircase) We need advice! Thanks! I would insist on repairs before closing, so not a deal breaker. Most builders uphold their warranties, and they want to keep their clients happy, so I suspect that your builder would do the same. As for the leak, has the cause for the leak been determined? Before the air conditioning is installed, contractors will leave the windows open to cool the house. If it rains, they do not bother to close the windows. I give this as an example of something that might not need repair. However, the greater concern is if the builder is repairing the source of the leak, or is he doing something to make you think that it has been repaired. If you know why the leak occurred, then check to see if a repair was made in that area. Have the construction manager explain the repair to your satisfaction. If you do not know the source, ask them to explain the repair, and how did this repair resolve the issue. If you had a home inspector, ask if they charge to come back out to examine the repair. My policy is not to charge when I have already inspected the property, and this is a common practice among many inspectors, but there are inspectors who want an extra fee, trip charge, of around $75. Once you are satisfied, then proceed with the closing. I also have brick window ledges with very little angle. Is there an insert available to cover the brick and give it some slope? I am afraid not to my knowledge. If the sill is causing a leak, the only method that I know to rectify the situation is to rebuild the sill.